Welcome to Talking Tots York and the surrounding areas. 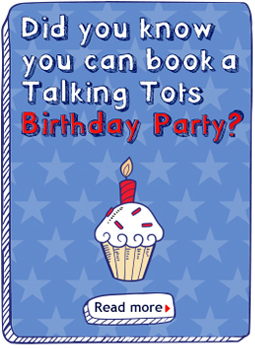 My name is Dave and I am delighted to bring Talking Tots to York and the surrounding areas. A former Deputy Headteacher at an Infant and Nursery School and early years specialist, as well as a dad to two bright and fun loving children, I have the skills and personality to help your child communicate with confidence. The sessions are fun and interactive. A mixture of games, songs, action rhymes, structured learning activities and stories will gently boost your child's language development and social skills. With nearly 50 percent of a child's learning occuring in the first four years of life (The National Literacy Trust) the Talking Tots classes will give your child an early and fun boost to their education. If you are interested in finding out more then please get in touch on 07729034844 or at dave@talkingtots.info and I will contact you ASAP. Alternatively, you might like to visit my Facebook page at Talking Tots York to keep up to date with all the latest news by clicking on the link below. If you would like to book your child a place then please click on the link on the classes page. Thank you. Sprites (12 months +) boosting early chatter. Sprinters (2 years +) building confident communication. Sparklers (3 years +) paving the way for school. To secure your child a place please complete the booking form by clicking on the link below. Thank you. The children really do learn so much at Talking Tots classes without even realising it because they are busy having so much fun! You can read below what the children, parents/carers, grandparents and members of staff attending the sessions have to say about Talking Tots York and the surrounding areas. "2 weeks into the programme and the children at the pre-school I work in are LOVING Talking Tots! The sessions are clearly fantastic fun for them, and they are learning at the same time. Highly recommended!" "I work as a child minder and I took one of my little girls to Dave's session at the local pre-school. When I collected her she was so animated and full of confidence in telling me all the things they had done. These sessions are amazing and help the children in so many ways. I can't recommend Dave enough as he shows real passion and commitment in delivering the sessions." "Emma told me she likes Dave. He is funny and she likes his beard. Emma's favourite game is jumping frogs"
"James said he loves Talking Tots. His favourite part is when Dave lifts the parachute above his head when they sing the Grand Old Duke of York!" "Elizabeth loves the rhyming games and the interaction. She also loves the singing"
"My son and I loved going to Talking Tots. Dave is wonderful and very dedicated. The sessions helped my son to become a lot more confident and we made some fantastic friends. I would always recommend it." "My daughter had a great time at her sessions with Dave. She looked forward to them each week and they helped build her confidence and skills ready for school. Thank you for making it so much fun for her. She will miss it." "I am an early years teacher and go with my two year old boy to Dave's sessions. We both love absolutely every minute of the session as the fun filled communication actiivities are varied each week and also link with other development e.g physical. Dave is full of energy, enthusiasm and really supportive of all the children and parents in the session. You're doing a great job providing children in York with this vital life skill - thank you!"